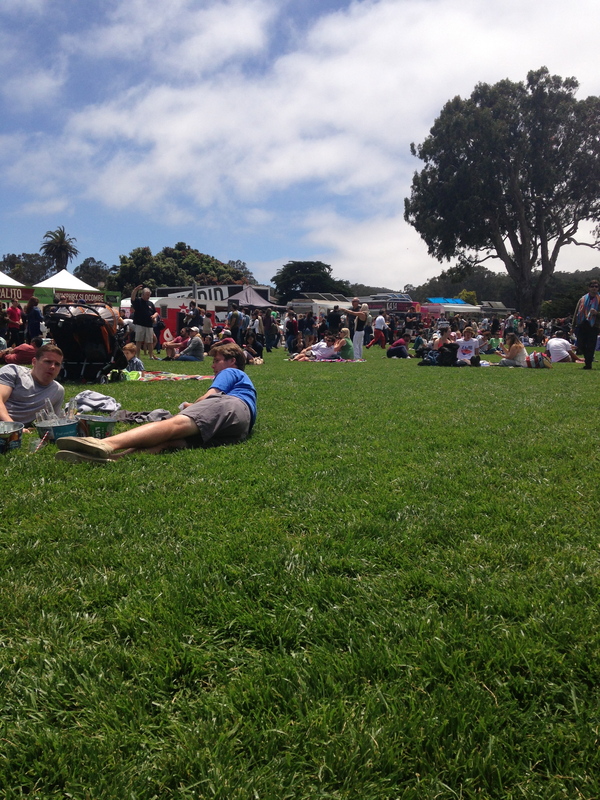 Off The Grid, the organized gathering of superb food trucks in San Francisco, has begun a weekly picnic event in the Presidio on Sundays. 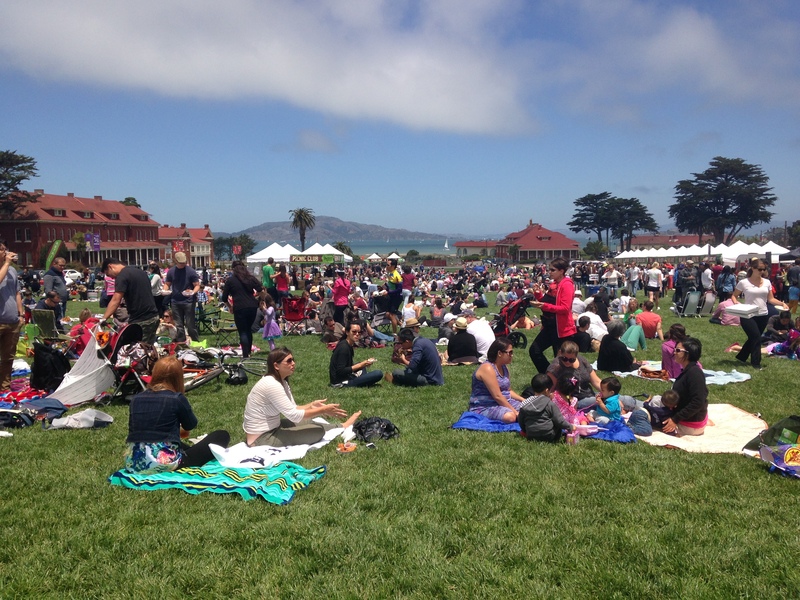 Many San Franciscans often don’t realize that Off The Grid gatherings occur almost every day of the week every week (not just on Fridays at Fort Mason), and Picnic Club is a prime addition to their schedule. Not only is the location in the Presidio beautiful, but there is also space for sitting and relaxing. While I have found myself at many Off The Grid’s eating standing up or crouching on a two-inch radius of cement curb, Picnic Club allows you to sit, lay, and even take a snooze on your blanket, if you would like, between your courses of food truck delight. 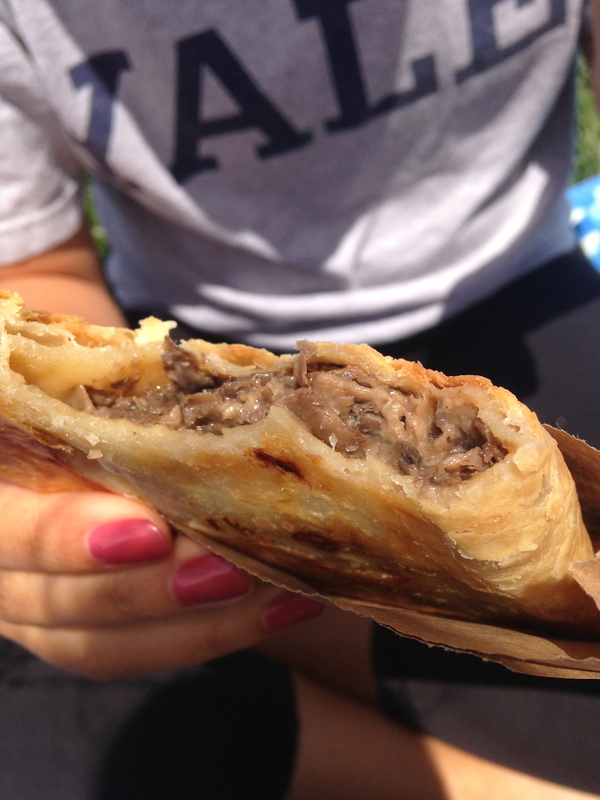 An empanada from El Porteno. Champiñones – Local Organic Mushrooms, Shallots, Parmesan, Creme Fraiche. Positively delectable. 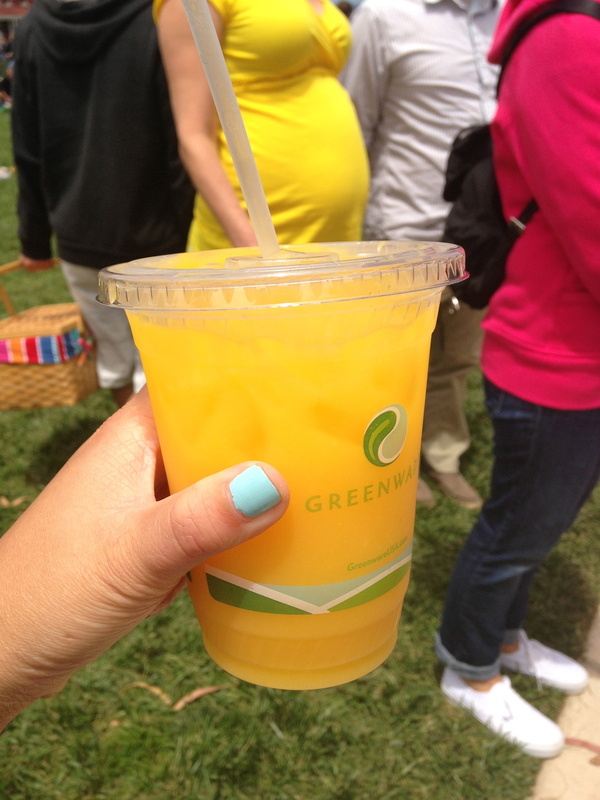 Mango-Maracuya Agua Fresca from Cholita Linda. 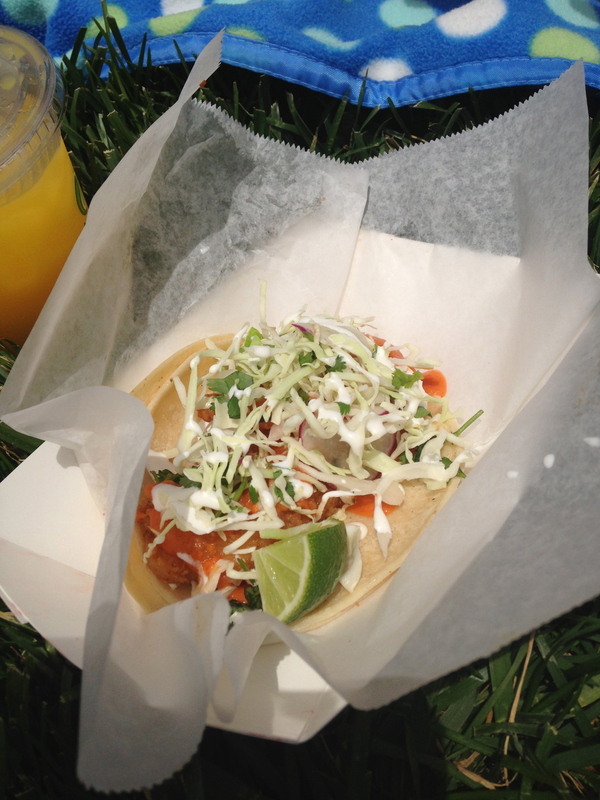 The BEST Fish Taco I have ever had, and I have had many. I absolutely love Fish Tacos, and this one was absolutely delicious (it’s tastiness may have also had something to do with just how hungry I was). One Baja Fish taco from Cholita Linda. You must try it. 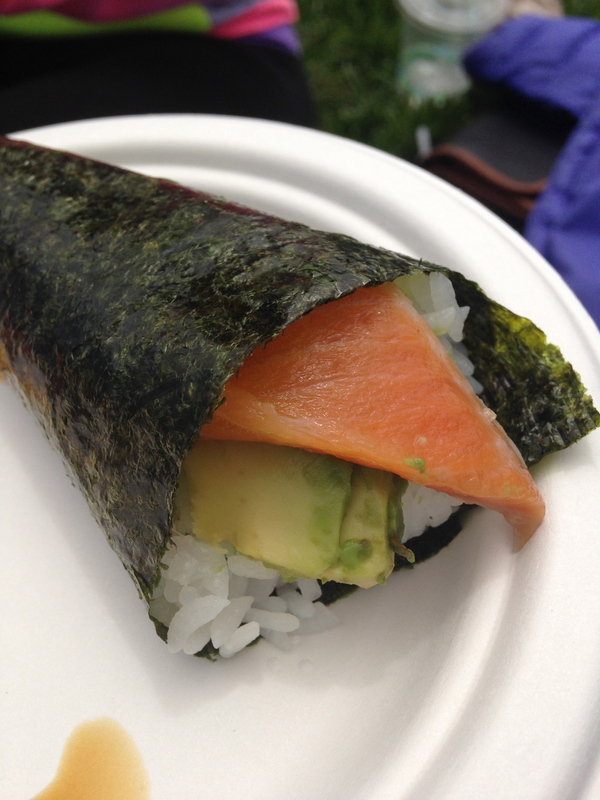 Salmon and avocado hand roll from Tataki. 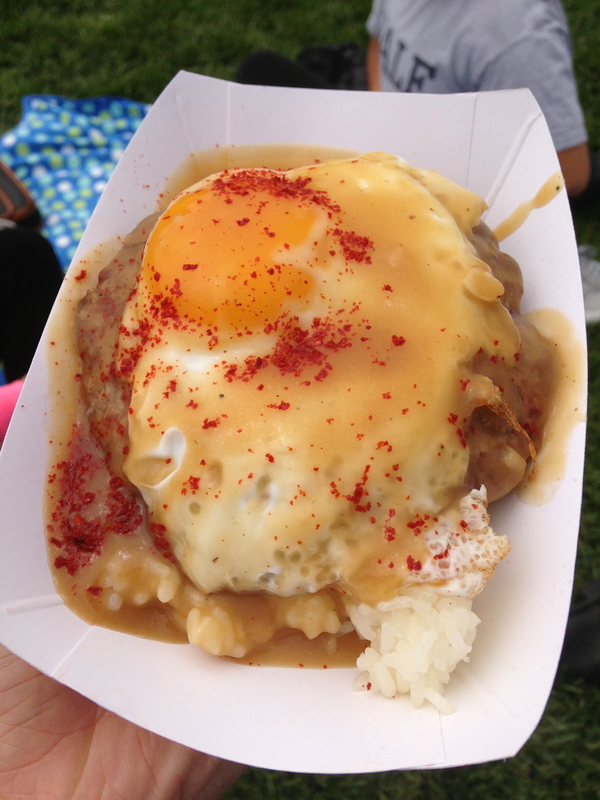 Namu Gaji Loco Moco – hamburger patty with fried egg and gravy on rice. Tasted good, but not my favorite. Fins on the Hoof Deviled Egg and Smoked Salmon Salad. 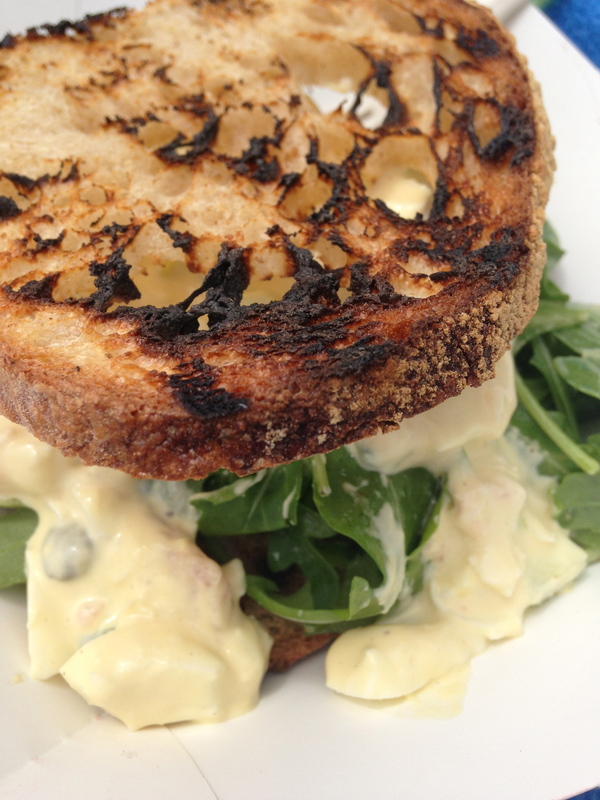 The actual salad was very liquid-y and the meal altogether could not be eaten as a sandwich and was rather messy. The flavors were not unique or particularly vibrant. I would not waste your time, money, or calories. My sister’s friend wanted fried chicken from Wing Wings, and I immediately jumped on board. 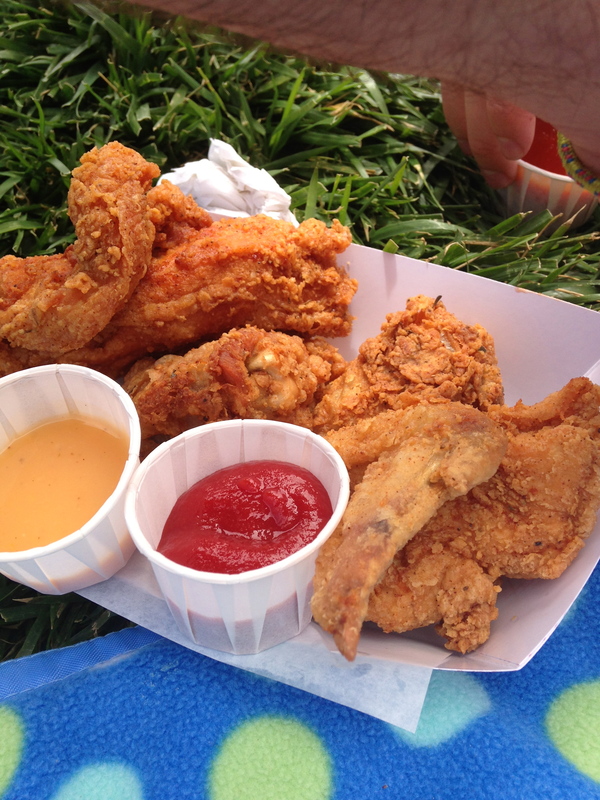 I have not had very much fried chicken in my life, and I don’t think I have ever had really good fried chicken. This chicken was quite delicious, and I enjoyed the variety of sauces that came with it. 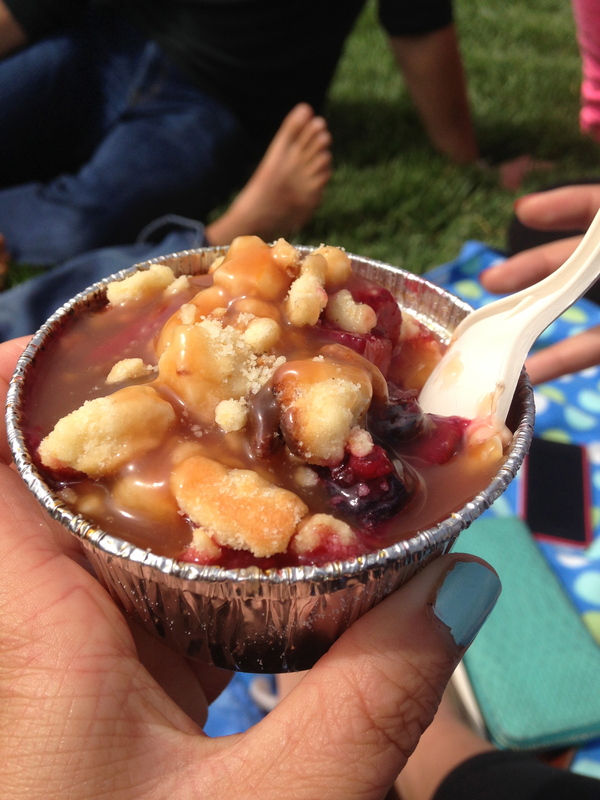 And finally…Crème Brûlée from the crème crulée cart with lemon shortbread, berries, and salted caramel sauce. Absolutely, mouth-wateringly delicious as usual. The crème brûlée cart has yet to disappoint me. My sister and I went to Picnic Club with a bunch of her friends and split everything. This way, we could try a little bit of a lot (as evident by the plethora of pictures above). I would recommend this over getting one big meal at Off The Grid. There is always something new to try, and although everything is pretty good, there is still a range between good and spectacular at OTG. You wouldn’t want to miss out on something spectacular. 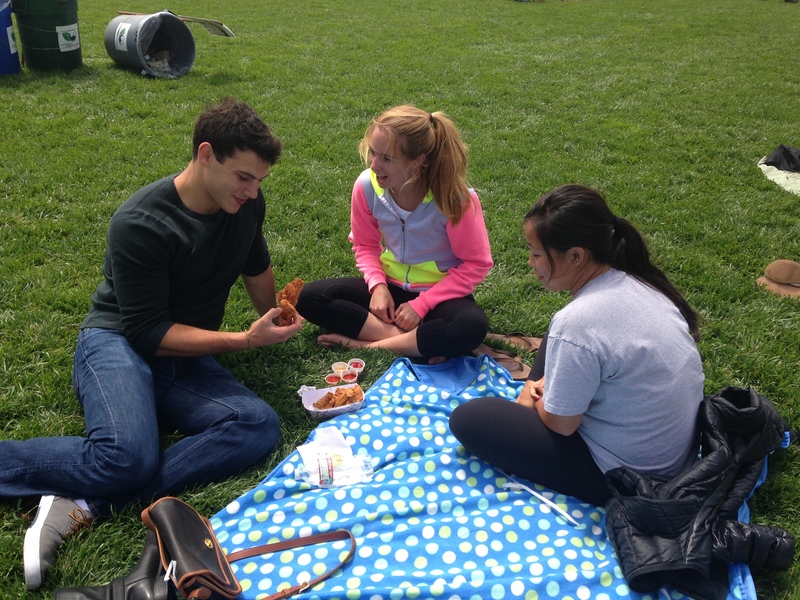 So I urge you…Go Picnic! Hey! Chris mentioned this the other night, so I thought I’d check in and say hi. Went to this on Sunday. The Namu Okonomiyaki is $2 cheaper here than they charge for it at the Ferry Building, and you can get it with chicken or beef as well as the egg, all of which I did. I await your dumpling roundup, or the soondobu testing–Yelp says My Tofu House is the best in the city, but is this actually true? I feel like we should eat dumplings or something before you leave. Or pizza.